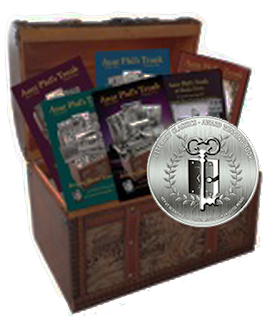 Author Laurel Downing Bill’s Aunt Phil’s Trunk Series is all-encompassing and a veritable treasure trove of Alaskan history from 1900 to 1985, as compiled by her aunt Phyllis Downing Carlson. With such a wealth of information, it stands to reason that this series would be incorporated for learning in classroom settings. Thus, the addendum to this series in the form of student workbooks for use in classroom settings. These workbooks are all prepared individually as companion pieces to each of the five books in this outstanding series. For use in classroom curriculum, the workbooks include various themes and an outline with instructions on how to use each section based upon the intended age of the audience. A rubric for questions is provided to help minimize grading disparity. Each workbook is broken out in units and includes word-search, crossword puzzles and more. Intended primarily for middle school and high school students, the workbook can likely be used for a broader audience as well. Each workbook is uniform in planning and design offering a seamless transition from one book to the next. The program Is well-thought out making this teaching aide a turnkey process that will make light work of such abundant material. Recommended for home-school settings and for use as a teaching tool, The Aunt Phil’s Trunk Workbook Series has earned the Literary Classics Seal of Approval.